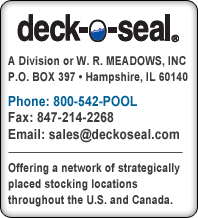 DECK-O-GRIP W/B (water base) is designed for various exterior concrete applications, including swimming pool decks, patios, sidewalks, and porches. This product meets the VOC requirements of the U.S. EPA and the state of California. It is specifically designed to retain and enhance the appearance of your concrete deck. DECK-O-GRIP W/B is a non-yellowing, water-based, blended, polymer-based, high solids, liquid sealer for decorative concrete. The product is clear, transparent and easy to apply. DECK-O-GRIP W/B also offers greatly improved chemical resistance when compared to standard acrylic-only based curing and sealing compounds. The product has been formulated to seal and protect decorative colored concrete by producing a hard, yet flexible, clear film. The compound contains a slip-resistant additive, which produces a slip-resistant surface, for use on traditionally slippery areas. This product is specifically formulated for the residential decorative concrete market. DECK-O-GRIP W/B is designed for various applications, including exterior concrete surfaces, driveways, patios, swimming pool areas and exposed aggregate, as well as any exterior surface where protection and sealing of concrete is desired. The use of DECK-O-GRIP W/B on any exterior concrete surface provides a durable, long-lasting finish that has improved resistance to chemicals, oil, grease, deicing salts and abrasion. Offers excellent slip resistance for slippery surfaces. May be used on all concrete surfaces, including stamped or stained concrete. Offers improved resistance to rain, sun, freezing temperatures, most acids and industrial chemicals, oil, grease, deicing salts, cleaning agents (except aromatic solvents), caustics, airborne soot, dust and other pollutants. Dried film is USDA accepted. Complies with EPA National AIM, Phase I OTC, and LADCO maximum allowable VOC requirements. SHELF LIFE (TYPICAL): One year in original, unopened container. ** Low concrete or air temperatures and/or high relative humidity will extend drying times. Mixing… For optimum performance, gentle mixing or agitation is recommended. CAUTION: DO NOT MIX EXCESSIVELY. Surface Preparation … Existing Concrete: Concrete surface must be clean and dry with all chemical form agents, stains, oil, grease, dust and dirt removed prior to application. New Stamped Concrete (At least 72 hours [three days] old): Surface must be clean and free from all powdered release agent residue. CAUTION: If a liquid compound other than W. R. MEADOWS CS-309™ series or VOCOMP® series products have been used, do not apply DECK-O-GRIP W/B until all traces of the compound have been completely removed and the surface is clean and dry. Application Method … MIX THOROUGHLY PRIOR TO USING. A typical commercial sprayer provides an easy, economical method of application. DECK-O-GRIP W/B should be sprayed with a 5916 nozzle that produces a flow of 1/10 of one gallon per minute. Spray on in a fine, fog pattern, without spurts or dribbles, to form a thin, continuous film. AVOID PUDDLING in low areas. If puddles occur, brush or roll them out. For added protection and a greater sheen on concrete, we recommend two coats of DECK-O-GRIP W/B be applied at right angles. Additional coats may be applied after the first coat has thoroughly dried. Drying Time… DECK-O-GRIP W/B dries quickly. Drying times may be extended depending on application rate, temperature, humidity and project conditions. Restrict foot traffic for at least six hours. Twelve hours is preferred. Cleanup … While DECK-O-GRIP W/B is still wet, equipment may be cleaned with soap and water. Once dried, the material may be removed with a solvent, such as xylene or toluene. KEEP FROM FREEZING. Do not dilute. Do not apply when air, material and surface temperatures are expected to fall below 40° F (4° C) within four hours of completed application. DO NOT MIX WATER-BASED COMPOUNDS WITH ANY COMPOUND CONTAINING SOLVENT. DECK-O-GRIP W/B is designed for colored concrete, but mottling may occur. Surfaces that have been acid-stained or acid-washed must be neutralized to a pH of seven. Do not use on dense or non-porous surfaces. For other specifications, secure the approval of the paint or resilient flooring manufacturer before applying product. Improper application of a sealer may prevent the film from adhering properly. Poor adhesion and/or entrapped moisture may cause the film to peel and/or turn white (blush). The specifier and user shall determine the suitability and assume all responsibilities therewith. Direct contact may result in mild irritation. Inhalation may cause irritation of the respiratory tract. Refer to Material Safety Data Sheet for complete health and safety information.